If you've been bitten by the filmmaking bug-even if you don't have a background in video or access to fancy equipment-Digital Filmmaking For Kids makes it easy to get up and running with digital filmmaking! This fun and friendly guide walks you through a ton of cool projects that introduce you to all stages of filmmaking. Packed with full-color photos, easy-to-follow instruction, and simple examples, it shows you how to write a script, create a storyboard, pick a set, light a scene, master top-quality sound, frame and shoot, edit, add special effects, and share your finished product with friends or a global audience. Anyone can take a selfie or upload a silly video to YouTube-but it takes practice and skill to shoot professional-looking frames and make your own short film. Written by a film and video professional who has taught hundreds of students, this kid-accessible guide provides you with hands-on projects that make it fun to learn all aspects of video production, from planning to scripting to filming to editing. Plus, it includes access to videos that highlight and demonstrate skills covered in the book, making learning even easier and less intimidating to grasp. 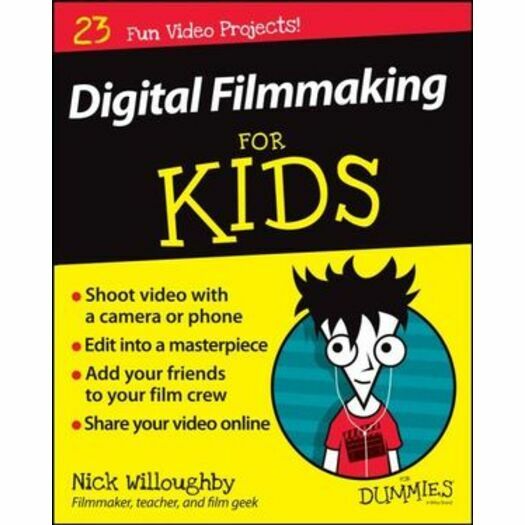 If you're a student aged 7-16 with an interest in creating and sharing your self-made video, this friendly guide lights the way for your start in digital filmmaking. Nick Willoughby heads Filmmaking For Kids and Film Future, a pair of programs designed to teach kids aged 7-16 the various aspects of filmmaking. Nick is also a writer and director for 7 Stream Media, a video and media production firm based in the UK.